Ganga Dussehra falls during dashami tithi of Jyaishta Shukla Paksha and usually during late May or early June. Ganga Dussehra is also known as Gangavataran which means 'the descent of the Ganga'. This year it will be observed on Saturday 3rd June 2017. Ganga Dussehra is dedicated to Goddess Ganga and this day is commemorated as the day when the divine river descended on the Earth to accomplish her mission to purge the cursed souls of Bhagiratha's ancestors. Before coming to the Earth, the Goddess Ganga, who emerged from the big toe of Lord Vishnu, was flowing in Brahmalok, the abode of Brahma. 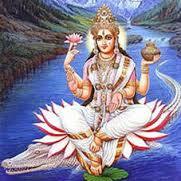 Along with her the Goddess Ganga brought the purity of heaven to the Earth. 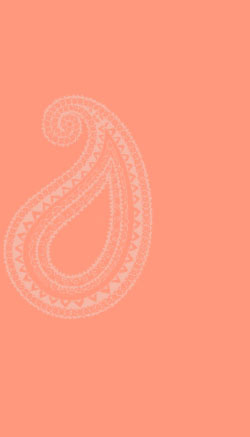 On Ganga Dussehra devotees worship Goddess Ganga and take a dip in the Ganges and make offerings in charity. The faithful flock to Allahabad/Prayag, Garhmukteshwar, Haridwar, Rishikesh, Varanasi and other places to take a holy dip. Ganga Dussehra celebrations are legendary in Varanasi. On Ganga Dussehra day thousands of devotees do Ganga Snan and participate in Ganga Aarti at Dasaswamedh Ghat. During this festival and especially on Ganga Dussehra, the devotees take a dip in the holy rivers of Ganga to purify them of all sins. If they are unable to do so, they purify themselves by sprinkling of Ganga Jal (water of the Ganges) that is kept in most Hindu homes. If you want to something special for Ganga Dussehra and are not near the Ganges or have access to the holy Ganges water, you can use pure water either from your tap or a good bottled type. Chant the purification mantra to purify this water and sprinkle on your head three times and then over the home and family. You could chant the mantras for Ganga or visualize the beauty of Ganges and meditate of letting go of your past and clearing up the negativity. Om a-pavitra: Pavitro vaa Sarvaavasthaamgato-apivaa. Himavan, the king of Himalayas and his spouse, Menaka, had two daughters of whom Ganga was the elder. Himavan sent her to the land of the gods in response to their request and she dwelt with them. Uma, the younger, won the favor of Lord Shiva and became his spouse. Sagara, a former King of Ayodhya, had no son for a long time. With his two wives, Kesini and Sumati, he went to the Himalayas and undertook vows and austerity. Sage Bhrigu, pleased with the king, blessed him and said: "You will get a number of children and will acquire undying fame. One of your wives will give birth to an only son, and through him your lineage will be continued. The other queen will bear sixty thousand strong-armed sons." Sagara's wives bowed low before the sage and asked which one of them would get an only son and which the sixty thousand children. Sage Bhrigu asked each of them their own desire.Kesini said she would be satisfied with one son who would continue the line; Sumati chose the other alternative. "Be it so," said the sage. Satisfied, the king and his wives took leave of the sage and returned to Ayodhya. In course of time, Asamanjas was born to Kesini; Sumati gave birth to a fissiparous mass which divided out into sixty thousand babies. This army of children was taken care of by nurses. Years rolled by; and while the sixty thousand grew into strong, handsome princes, Asamanjas turned out to be a cruel sadist. He indulged in the pastime of throwing little children into the river and laughed merrily as they struggled and died. Naturally people hated this maniac and banished him from the country. To the great relief of all, Asamanjas' son, Amsuman, was the opposite of his father and was a brave, virtuous and amiable prince. Once King Sagara decided to perform a grand horse sacrifice and prince Amsuman was in charge of the sacrificial horse, but Indra, in the guise of a Rakshasa, managed to carry off the animal. The Devas regarded yagnas by mortals as a challenge to their superiority, and lost no opportunity of throwing obstacles in their way. If, however, all obstruction was overcome and the yagna was completed, they accepted offerings made to them. And then he who performed the yagna got due reward. The king was greatly upset when he heard that the sacrificial horse was stolen. He sent out the sixty thousand sons of Sumati to go in search of the animal all over the earth and to spare no pains to retrieve it. "The loss of the horse," he impressed on them, "not only means obstruction to the yagna; it casts sin and ignominy on all concerned. You should, therefore, recover the horse, wherever it may be kept hidden”. Eagerly the sons of Sagara proceeded to search the entire earth, but the horse was nowhere to be found. They even started digging the earth as for buried treasure, and in their anxiety respected neither place nor person and only succeeded in earning the hatred of all they met. The horse was nowhere to be found and when they reported their failure to the King, he bade them ransack the nether world also. The princes did as they were told and in Paataala they saw the horse grazing in a corner of an ashram, not far from the place where Sage Kapila, who was none other than Lord Vishnu, sat in meditation. The princes at once jumped to the conclusion that they had not only found the stolen horse but the thief also, and they rushed on Kapila shouting, "Here is the thief pretending to be a yogi." Kapila thus disturbed opened his eyes and the sixty thousand princes were reduced to a heap of ashes. Indra, the real thief, had artfully left the horse here with this very intent. King Sagara waited in vain for the return of the princes who had gone in search of the sacrificial horse. After some months he called his grandson, Amsuman, and said: "I am anxious to know what has happened to the princes, your uncles who went to Paataala. You are brave; go thither, well-armed and find out what has happened and return crowned with success”. Amsuman went closely following the path of the princes and reached the nether world where he saw and paid salutations to the mighty elephants standing guard at the four quarters. These guardians of the quarters uttered encouraging words and said he would succeed in his mission. When in due course Amsuman entered and went round Paataala he was delighted when he found the sacrificial horse grazing contentedly there, but was perplexed and distressed when he saw heaps of ashes all over the place. Could they be all that remained of his valiant uncles? Garuda, the bird king and brother of Sumati, King Sagara’s second wife, who chanced to be there told Amsuman: "Those ash heaps are all that is left of the sixty thousand sons of Sagara who were consumed by the wrathful glance of Sage Kapila. Dear child, take the horse and complete the yagna. If these ashes are to be watered according to custom so that the souls of the princes may rest in peace, the divine Ganga should be brought down here from the land of the Devas”. Amsuman rushed home with the horse and told the king all that he had found and learnt. Sagara was immersed in sorrow at the fate that had overtaken his sons. However, the horse having been brought back, he completed the yagna. Grieving over his lost sons and despairing of ever bringing Ganga down to the nether world, he died disconsolate. Amsuman succeeded Sagara as King of Ayodhya and was, in turn, succeeded by Dileep. Bhagiratha came after Dileep. Amsuman and Dileep though happy and blessed in other respects, died grieving that they were unable to bring Ganga to Paataala for the salvation of their forefathers. Bhagiratha was a valiant king. He was childless. Desiring progeny and hoping to bring Ganga down, he left for Gokarna to perform penance, leaving the kingdom in the hands of his ministers. Bhagiratha undertook severe austerities. With fire on all sides and head exposed to the hot sun, and taking food but once a month, he continued his penance. Bhagiratha's name has become synonymous with great perseverance in any good cause. Lord Brahma, pleased with the tapas, appeared before Bhagiratha and asked:"What would you have, my son?" Bhagiratha told him his two wishes: "If you have pity on me, kindly bless me with a child to continue the line of my forefathers. Secondly, cursed by Kapila Muni, my ancestors lie a heap of ashes in Paataala. The ashes should be washed by the waters of Ganga so that their souls may ascend to heaven. May you be pleased to order Ganga to descend to the mortal plane." Brahma replied: "The Devas are pleased with your tapas. You wishes are granted. But there is one difficulty. The earth cannot withstand the force of Ganga's descent. Shiva alone can withstand it. Therefore direct your penance and prayers to him." Bhagiratha renewed his tapas and continued long without food or water and at last won Lord Shiva’s grace. Shiva appeared and said to Bhagiratha: "I shall fulfill your wish. I shall receive Ganga on my head. May her grace be upon you. When Mahadeva promised help to Bhagiratha, Ganga began her descent as ordered by Brahma. In her arrogance, she thought she would fall on Mahadeva's head and sweep him away towards Paataala. Knowing her mind, the three-eyed God decided to teach Ganga a lesson. And the moment he willed it, the flood of waters that fell on his head were held by his matted hair as in an infinite receptacle. Ganga tried her best but not a drop could emerge from the tangled maze of Siva's matted locks. This was a lesson to Ganga to be sure, but a heart-breaking disappointment to Bhagiratha. There was nothing for him but to propitiate Shiva with prayers. 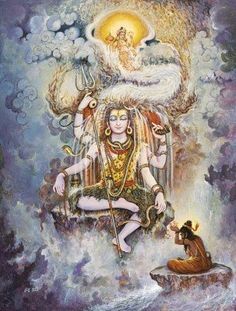 This he did to such good purpose that Shiva took pity on him and gently let out the waters of Ganga in Bindu Saras from where they flowed down in seven small separate streams. Three of them flowed west and three east; and the seventh river followed Bhagiratha who was full of joy at the approaching salvation of his ancestors. Ganga followed Bhagiratha's triumphal chariot; the waters danced and shone like lightning flashes as the river made its course and the Devas and Gandharvas assembled above to witness the grand sight. Sometimes slow and sometimes fast, now sliding down and now jumping up, the river went on dancing behind Bhagiratha's chariot and the gods in heaven enjoyed the sight all the way. 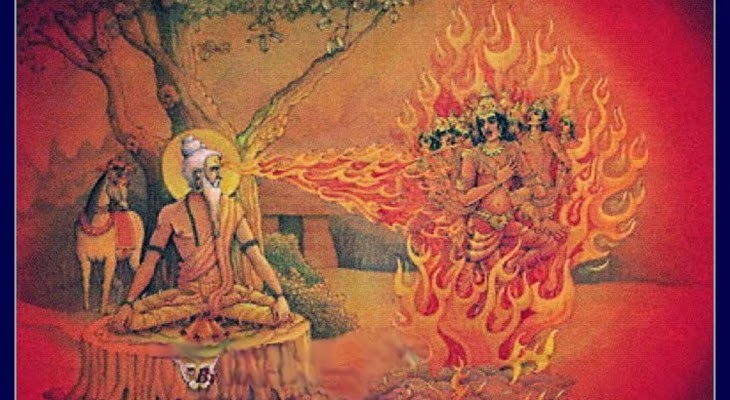 On her course, Ganga damaged the yagna platform of a rishi by name Jahnu. The rishi took the entire flood in his palm and sipped it off. Ganga disappeared again and Bhagiratha was sorely perplexed. The gods and other rishis approached Jahnu and begged him to forgive Ganga and allow Bhagiratha to reap the fruit of his great austerities and perseverance. The sage relented and let Ganga out through his right ear. The Devas were glad and blessed Ganga thus: "Coming out of the saint’s body as out of your mother's womb, you are now Jahnavi, Sage Jahnu's daughter. There was no further hindrance or mishap and Ganga reached Paatala through the ocean. With the holy waters, Bhagiratha performed the funeral rites for his arcestors and secured for them their entry to heaven. Bhagiratha' s efforts for having brought Ganga down, she is known as Bhagirathi. Those who bathe in the holy waters of Ganga or read or listen to this divine story with devotion, will be cleansed of negative reactions and be endowed with virtue, strength and unflagging zeal.